As shown, Apple's Maps directs you to the National Park (from Sydney) when searching for Mildura, whereas the town's real location is 70km north, as we have circled. Victoria Police is warning motorists to keep away from the current version of Apple’s Maps app due to five separate incidents where persons were directed off-road and into dangerous terrain. Apple Maps was introduced alongside the launch of iOS 6 on September 19, and has received an overwhelming share of criticism since. 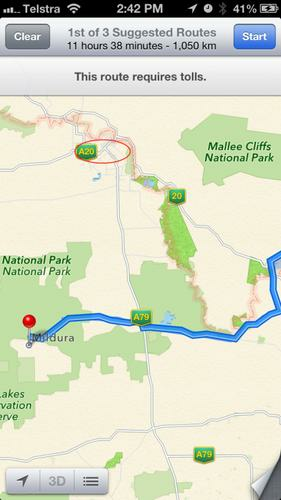 As the above image highlights, the location of Mildura is marked within the Murray-Sunset National Park, and this is where motorists have been directed only to find themselves 70km from the town’s actual location (as circled), according to Victoria Police. Media officer, Acting Senior Sergeant Sharon Darcy, reported that some of the motorists located by police were stranded for up to 24 hours without food or water, and walked long distances to find reception. Darcy said that Victoria Police is “extremely concerned as there is no water supply within the Park and temperatures can reach as high as 46 degrees, making this a potentially life-threatening issue." Although the Police has notified Apple in hope of a resolution, Darcy said that motorists should stay away from the app altogether, and rely on other services or dedicated GPS devices for directions. This report follows a string of global incidents regarding the misinformation provided by Apple Maps. CEO, Tim Cook, issued an apology about the issues.